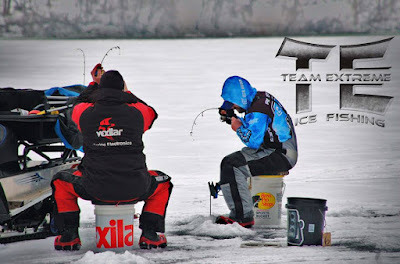 Ice fishing is sport that has grown so rapidly that at times it is hard to keep up. At times anglers get caught up in all the latest gear and fancy equipment when it's the little things that most often put fish on the ice. I was reminded of this the other day on a quick trip to a local lake with good friend Chad Pietig. We set off to fish Hickory Grove Lake after work for a few hours to see what we could find. We loaded all of our gear onto my snowmobile and ice shack and headed to our first destination. Pulled up to a brushpile...didn't even look at my GPS. I cut a few holes and sure enough we were right on the brushpile. We caught a few fish but the fish we were marking on the Vexilars were not in a good mood. We packed up and hit another brushpile, much deeper than the first. After dropping the Vexilars this time we noticed there was not many fish present here. We didn't stay long and went to the third brushpile. Again, there was really no need to look at the GPS system as I have fished this brushpile for a decade or more. This pile showed a lot of fish and they were quite active too. So, what about the little things...yes now for the little things. Sure, a snowmobile got us to the areas quickly, the Vexilars show us brushpiles and active fish or not, but when it came down to catching fish it was all about a small thing. Jig color. Chad was using two-tone colored jig which was getting more bites and attention than any jig I was showing the fish. I tried numerous colors, white, pink, red, blue and black...but nothing compared to the "magic" jig that night. That jig may never be the "magic" jig again on that lake, but a lesson I learned and a reminder to focus in on the little things while ice fishing will help me catch more fish in the future. This past weekend marked the first ice fishing tournament of the year for me. For the third year in a row my partner Mark Anderson and I will be competing on the Team Extreme Ice Fishing trail. This circuit was set to start the season at Okoboji in early January, but Mother Nature did not provide enough ice and it was canceled. 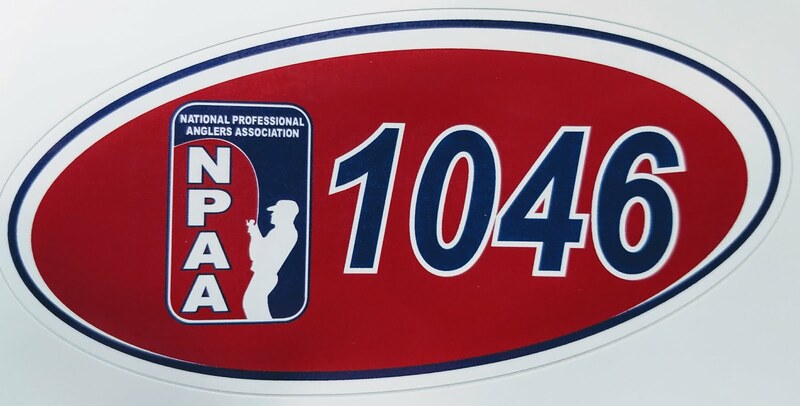 The next event is at Brushy Creek and the National tournament is in mid-March in Minnesota. This weeks challenge was Big Creek Lake on the north side of Des Moines. This is a large lake for Iowa, and has a lot of deeper water, brushpiles, drop-offs, and old river channels to keep anglers in search of panfish all year long. The lake has a great population of bluegill, but in the past few years the crappies are hard to find. We once again found this to be fact during practice time on the lake the past week. Mark and I had fished the lake numerous days prior to the tournament and just couldn't find more than one or two crappies hanging together. We knew it was going to be difficult to catch our goal of 8 crappies for the tournament but knew that we would have to catch some to win the event. On the other hand, bluegills was the other target for the day, we could weigh in 8 of those for our total of 16 fish. Both of us found numerous brushpiles that were holding quality bluegills, we were very confident we could catch nice gills and fairly quickly too. Tournament day began at 8am and we were off to look for crappies. We tried several areas, deep trees, drop-offs, channel swings, and nothing, not a bite, not a fish. We decided to get to some bluegill areas and gather in our 8 gills. With our Vexilar FLX-28's in hand we proceeded to do this as we though, our first brushpile we visited we caught fish after fish and have 8 nice bluegills with most at or above the 9-inch mark. We went to one other pile Mark added a couple more big gills, now we have all our gills at or above the 9-inch mark. We were very satisfied with this and we started back to some crappie terrain. We different areas, and repeated some areas of the morning search too, I ended up hooking one crappie and we ended the day with 8 great gills and 1 crappie, far short of our 8 and 8 goal. I had the chance to hit a couple local ponds this past weekend and I made every minute count. With temperatures hovering around zero, and 25 mph northern winds pushing the real-feel temps to a chilly -20, it was a day not for the weak. On days like this you really depend on your clothing to enjoy the day. The average winter coat and bibs are not going to handle the type of weather we had that day. 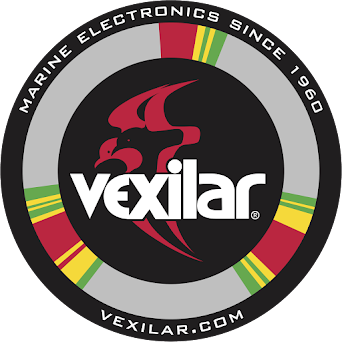 There are many companies that make great outdoor gear, one that I have chosen for years is the Vexilar Cold-Snap Gear. The Tundra Bibs and parka coat made it bearable to be out in the elements to search out fish and set up the shack to fish them. Of course a good pair of boats is key on a day like this too. While most people will say you get what you pay for, and I too believe that much of the time in life, however not with winter boots. My $40 Mickey Boots, an Army surplus item that sells on eBay and any Military surplus store have never let me down. They are 100% waterproof, and they are very warm. 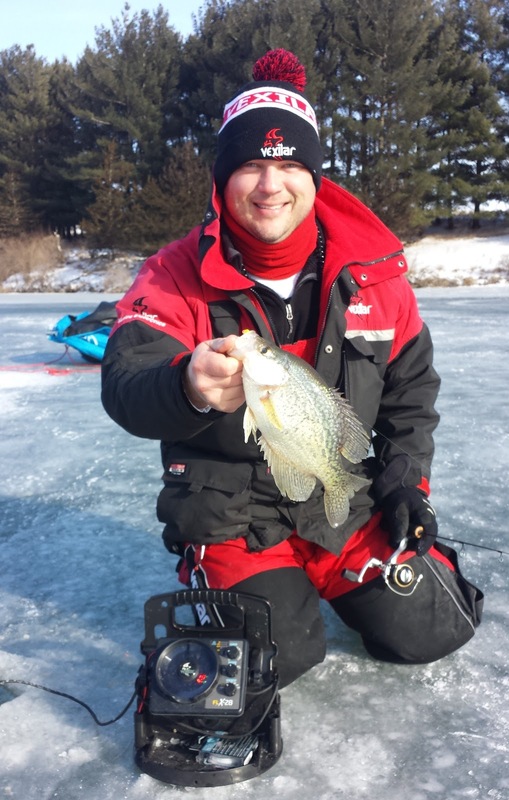 If you are searching for Ice fishing gear to keep you warm, look up Vexilar Cold-Snap Gear and the Mickey boots to get you on the ice to catch fish under the most extreme temperatures. Without them, I would have never even gone fishing! On to the fishing... as mentioned a couple farm ponds were on the schedule for this day, as the bigger lakes in the region just aren't made for traveling quite yet for me. The first pond we hit has multiple brushpiles in it and it didn't take long to find the active fish. Being there while the sun was hitting the top of the trees sure helps this time of year to find active/feeding fish. After locating the brush pile with several holes, I studied the readings the Vexilar was giving me in several holes. I noticed that there were many more fish around, or outside of the brushpile than right in or on top of the pile. This is often not the case, but for this day it certainly was. We set up about 10 feet from the heart of the pile and enjoyed catching crappies and gills for several hours. Multiple color of jigs and plastic baits were working (as long as they had a small profile), as well as spoons for the suspending crappies. The bite started to fade around noon and we decided to warm up a bit and drive to the next pond. This pond is absent of any cover, it is an old, featureless pond that doesn't have a large population of fish, but the fish you catch are on the large size. We were hoping for the "foot-long" crappie or a 10-inch gill, but just fell short on both. 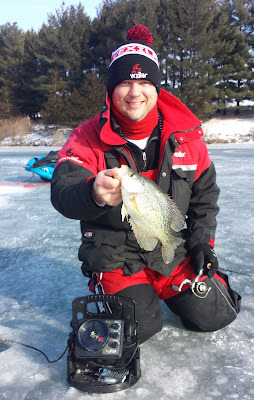 We did come very close on several crappies that topped out around 11.5 inches. Needless to say it was a great day of fishing, but without the right clothing and comfort of a shack to get out of the wind, I would have been stuck at home. ~~~One last note, on a day where the weather was truly bone-chilling, the ease and power of an electric auger was certainly a treat. No more pulling on gas engines to get them to start, all it takes is the pull of the trigger of a drill. Electric drill augers keep impressing me, and that day was no different in that chilling cold air and wind. I will try to cover more information on electric drills in another segment soon. 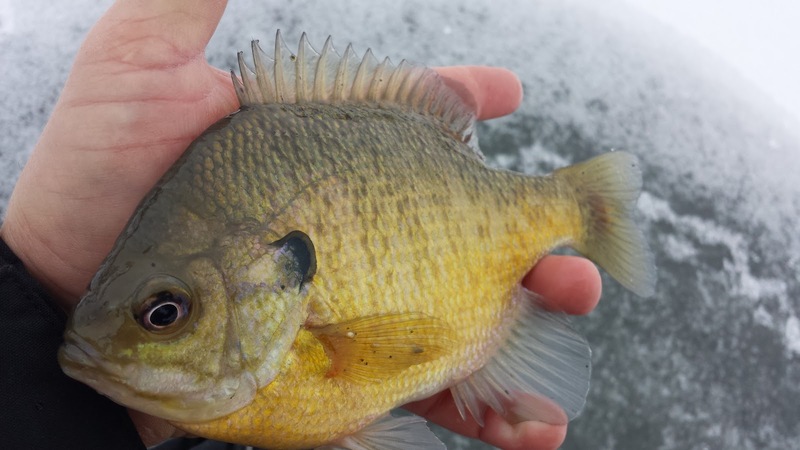 This winter, to sum it up has been quite disappointing when it comes to ice fishing. I cannot remember a time when I was not ice fishing in December in this great state of Iowa. It was so bad that a few weeks ago a friend and I made a run to South Dakota just to fish for a day...yep borderline crazy but desperate times call for desperate measures. This past weekend I was able to finally find some ice in Marshall County to help me scratch the itch a bit and give me a little hope to the rest of the ice fishing season. The ice was by no means perfect, and out of 5 area ponds, we only actually dropped lines in two of them. 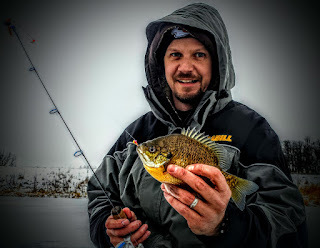 The ice varied greatly from one pond to another, something to keep in mind during this early ice fishing season.I know most people reading this are avid ice anglers but just a few tips to keep us ALL safe this ice fishing season. ~ The Iowa DNR recommends at least 4 inches of ice for ice anglers and at least 5 inches to support ATV's and snowmobiles. ~ Each pond is unique and freezes at its own speed. Shade, wind, runoff water, and precipitation all factor in to how fast a body of water will freeze. ~ Never assume that just because someone is fishing a pond, that all ponds are ready to walk on. ~ Drill often, and measure every time, it's the only way to know for sure. ~ ALWAYS take the proper safety gear with you when ice fishing. These are include: ice picks (wear around your neck in case you fall in), long rope, flotation device and at least one friend. ~ No ice is SAFE ice, always be cautious. Enjoy my friends, and I hope to see you on the ice very soon!